In this powerful book, the renowned exorcist of Rome tells of his many experiences in his ministry as an exorcist doing battle with Satan to relieve the great suffering of people in the grip of evil. The importance of the ministry to "expel demons" is clearly seen in the Gospels, from the actions of the Apostles, and from Church history. Fr. Amorth allows the reader to witness the activities of the exorcist, to experience what an exorcist sees and does. He also reveals how little modern science, psychology, and medicine can do to help those under Satan's influence, and that only the power of Christ can release them from this kind of mental, spiritual or physical suffering. An Exorcist Tells His Story has been a European best-seller that has gone through numerous printings and editions. No other book today so thoroughly and concisely discusses the topic of exorcism. 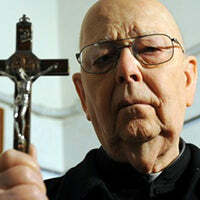 Gabriele Amorth was an Italian Roman Catholic priest and an exorcist of the Diocese of Rome who claimed to have performed tens of thousands of exorcisms. Amorth authored two books specifically on exorcism. The two books An Exorcist Tells His Story and An Exorcist: More Stories are not official Roman Catholic documents, rather personal accounts of his office as Exorcist. The books use witness accounts and personal experience as evidence. The two books include references to official Roman Catholic teachings on demonology, however the main emphasis is on Amorth's experience as an exorcist. Both include references to the diagnosis and treatment of spiritual problems. The books briefly cover the topics of demonic contraction and curses. In the introduction, Father Amorth openly states that this book is not intended to demonstrate truths such as the existence of demons, the reality of demonic possession, and the power to expel demons, because those truths have already been revealed and are constantly taught by the Magisterium. Instead, Amorth wrote this book to serve as guidelines for other exorcists because it’s so hard to become learned in this area, largely because there is no longer any master/apprentice type of learning process. By seeing accounts of the tangible effects of witchcraft, in a weird way, it strengthens your faith in the sacraments, in that these aren't just empty rituals that are being performed, there is a deep, substantial impact on the participants. By demonstrating and showcasing the spiritual powers of evil, in a strange way it also reaffirms the spiritual powers of good which were handed down through the Apostolic succession of the priesthood through the sacrament of Holy Orders. But perhaps the most important aspect of the book is that it makes you reflect how your own life is similar to that of those who are possessed. Like them, Satan’s influence also ebbs and flows with you, based on how frequently you receive the sacraments, pray, and make an effort to lead a good Christian life.